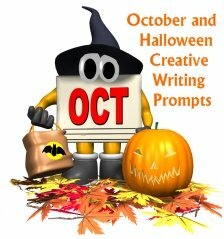 October and Halloween Writing Prompts: Are you looking for a creative list of writing prompts and journal ideas to use during the month of October? 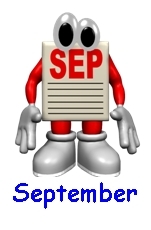 Below, you will find a list of general October writing topics and a list of specific calendar dates for October which contain creative writing ideas related to that particular date in October. 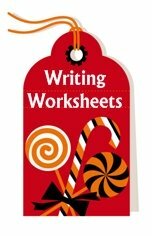 You will be directed to another page on Unique Teaching Resources that contains detailed lesson plan ideas and printable worksheets for those October writing prompts. You will be directed to another website that contains useful information related to those particular October writing prompts. These Haunted House printable worksheets can be used for many of the October writing prompts that are found on this page. 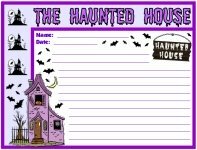 These Halloween Ghost printable worksheets can be used for many of the October writing prompts that are found on this page. 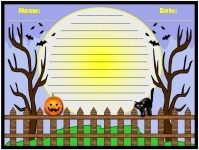 These Halloween Spooky Night printable worksheets can be used for many of the October writing prompts that are found on this page. 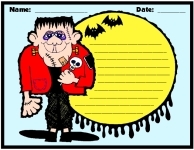 These Frankenstein printable worksheets can be used for many of the October writing prompts that are found on this page. 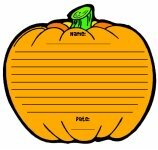 These pumpkin shaped printable worksheets can be used for many of the October writing prompts that are found on this page. What's Brewing? 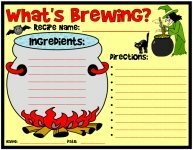 Write a Recipe for Witch's Brew. "Witch" Story Do You Like Best? 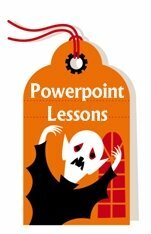 These Witch printable worksheets can be used for many of the October writing prompts that are found on this page. 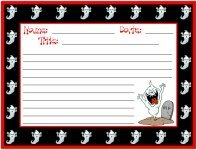 These Graveyard printable worksheets can be used for many of the October writing prompts that are found on this page. 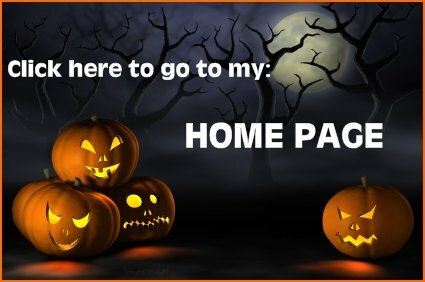 about each of these October writing prompts and holidays. The purpose of National Book Month is to encourage readers of all ages to enjoy books. To coincide with National Book Month, the National Book Foundation announces its National Book Awards during the month of October. What is a book that you recommend that other children your age should read during National Book Month? Explain why this is one of your favorite books. What is a book that you recommend to read aloud to kindergarten students during National Book Month? Explain why you recommended this book. Write a book report project describing your favorite book. 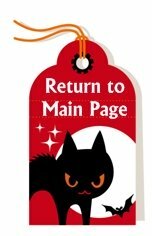 My Favorite Book Report Page contains a fun book report template (shown below) shaped like a first place trophy that is ideal to use with your students during National Book Month. Visit Oprah's Kids' Reading List page to use Oprah's guide from the American Library Association to find book lists that are divided into age levels, as well as different interesting categories. On the Ways to Celebrate National Book Month page there are some good ideas for how to celebrate this month such as creating a class book club, book swaps between students, book parties, and involving the whole family in reading during October. 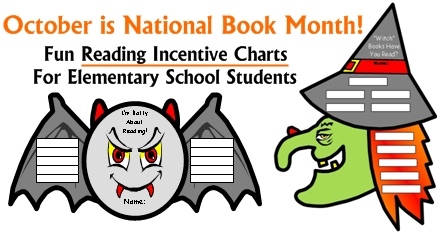 National Book Month is a great time of the year to begin using reading incentive charts with your students. 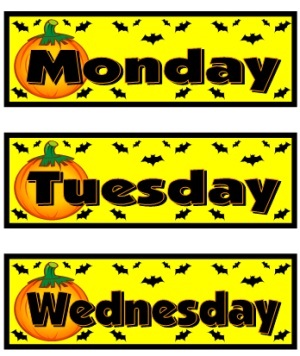 On my Halloween English teaching resources page you will find bat and witch reading incentive charts (shown below) that will help you to encourage your students to read during the month of October. National Pizza Month is in October and we began celebrating National Pizza Month in 1987. Since children ages 3 - 11 prefer eating pizza over all other foods for lunch and dinner (according to a recent Gallup Poll), this is a great topic to use to engage your students in fun creative writing activities. 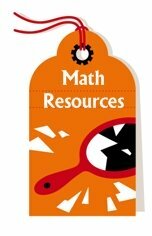 Below you will also find some unique pizza lesson plan ideas that include reading and math activities as well. Write a persuasive essay explaining why there should be a day off from school in October to celebrate National Pizza Month. Using the 5 senses (sight, hearing, touch, smell, and taste), describe your favorite type of pizza to eat. National Pizza Month is an ideal time of the year to introduce your students to my Pizza Reading Sticker Charts that will encourage your students to read books independently this school year. 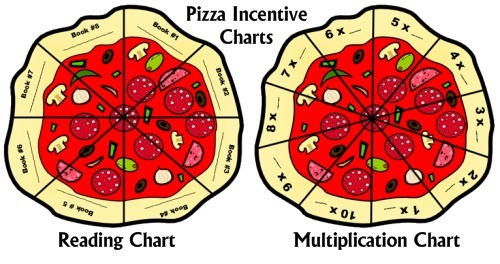 This is also an ideal time of the school year to introduce your students to my Multiplication Pizza Sticker Charts that will encourage your students to learn their times tables. 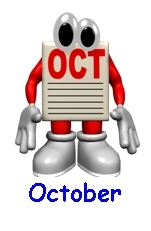 In 1984, the National Crime Prevention Council (NCPC) designated October Crime Prevention Month. The NCPC's mission is to be the nation's leader in helping people keep themselves, their families, and their communities safe from crime. Write an essay explaining why you admire police officers and the difficult jobs that they have. 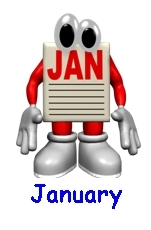 Have your students visit McGruff the Crime Dog Child Safety Center Website and write a list of crime prevention tips that they learned from this website. On the National Crime Prevention Council's Resources page you will find a variety of useful resources about the following topics: bullying, cell phone safety, Halloween safety, Internet safety, and home safety. 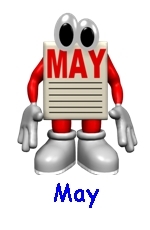 To tie in with National Crime Prevention Month, have your students complete a wanted book report project. 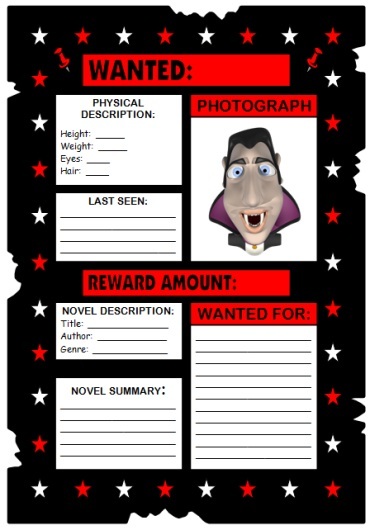 My Wanted Poster Book Report Page contains a fun book report activity (shown below) that is ideal to use with your students during National Crime Prevention Month. National Fire Prevention Week is observed in the United States during the week in which October 9th falls. The first Fire Prevention Week was observed in 1925 by a proclamation made by President Calvin Coolidge. Write an essay explaining why you admire firemen and the difficult jobs that they have. Name some precautions that you can take at home to make your home safe from fires. 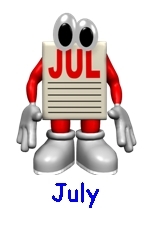 Have your students visit Sparky the Fire Dog Fire Prevention Website and write a list of fire prevention tips that they learned from this website. To learn about preventing wildfires, visit Smokey The Bear's Wildfire Prevention Website. On the PBS Arthur Fire Safety page, students can read fire safety tips from Arthur that will help them to be smart, be prepared, and be safe. National School Lunch Week is celebrated in the United States in October. It was created in 1962 by President John F. Kennedy, 16 years after President Harry Truman signed the National School Lunch Act into law. Why is it important for students to eat a healthy lunch? What is the best school lunch you've ever had? Can you think of three ways to make the lunches at your school better that include healthy food items on the menu? 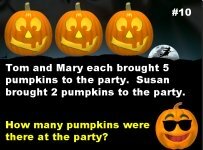 The School Nutrition Association web page, contains information about National School Lunch Week, as well as fun puzzles and school lunch related brainteasers for your students. Columbus Day is celebrated on the second Monday of October in the United States. This holiday commemorates the landing of Christopher Columbus in the New World on October 12, 1492. Pretend that you are an explorer and want to take an expedition to an unknown land. You will need money to finance your adventure. Write a letter to a king, queen, president, or a wealthy person to ask for help to finance your adventure. Write about an imaginary voyage and create a map that charts your route. Have a discussion about navigation and exploration with your students and show how them how to use a compass. Give your students a map of your school (or the playground area) with coordinates or directions, and then send them on a Columbus Day treasure hunt for items that you have hidden. By using the directions and photographs on the Kaboose Egg Cup Ships page, have your students make mini versions of the Nina, Pinta, and the Santa Maria using egg cartons. Visit Wikipedia's Columbus Day Page to learn more information about this holiday. National Dessert Day is celebrated on October 14 and it is one of the tastiest holidays of the year! What is your favorite dessert? Write a recipe for how to make your favorite dessert. Include the ingredients needed and the directions for each step in the recipe. Invent a new dessert for Willy Wonka's Chocolate Factory. Design a poster advertising this new dessert product. Combine National Pizza Month with National Dessert Day by making a brownie pizza with your students. 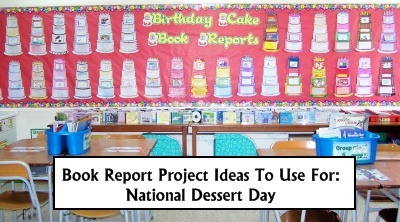 To tie in with National Dessert Day, have your students complete a birthday cake book report project. My Birthday Cake Book Report Page contains a fun book report activity (shown below) that is ideal to use with your students on National Dessert Day. World Food Day is recognized on October 16. This day was created to call attention to the shortage of food in many parts of the world. World Food Day was proclaimed in 1979 by the Conference of the Food and Agriculture Organization (FAO) and marks the date of the founding of the FAO in 1945. The purpose of this worldwide event is to increase public awareness of the world food problem and the struggle against hunger, malnutrition, and poverty. Name three things you could do to help children in other countries on World Food Day. Name three things you could do to help children in your own community on World Food Day. The World Food Program provides information about world statistics for hunger and malnutrition. Feeding Minds Fighting Hunger is a website that explores the problems of hunger, malnutrition, and food insecurity. This website contains detailed lesson plans for teachers on hunger and malnutrition at the primary, intermediate, and secondary levels. Dictionary Day is celebrated on October 16 in honor of Noah Webster. The objective of this day is to emphasize the importance of dictionary skills and to improve your vocabulary. Webster was born on October 16, 1758 and he is considered to be the "Father of the American Dictionary." Noah Webster began to write his dictionary at the age of 43 and it took him 27 years to finish it. 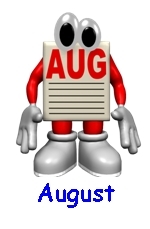 Create an A to Z Dictionary (or word list) based on your favorite hobby or sport. Find 5 words in the dictionary that you are unfamiliar with and write their definitions on your paper. 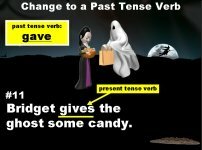 Write a sentence using each of these 5 new words that you learned. Have your students complete a Biography Newspaper Project about Noah Webster. As a group project, have your students complete a Character Body Book Report Project about Noah Webster together. Visit Wikipedia's Noah Webster page to learn more this American educator. On Webster Word Central students can play spelling and vocabulary games. United Nations Day is celebrated on October 24 and it recognizes the United Nations organization and all of the people who participate and serve in this world organization. People around the world look to the United Nations to help alleviate poverty and hunger, to keep the peace, to expand education, and stand up for human rights in every corner of the globe. The United Nations delivers humanitarian aid to the neediest areas in the world. They vaccinate 40 per cent of the world's children. They feed more than 100 million people and help millions of refugees, most of them women and children fleeing war and persecution. On this day, I often read my students The Way to Start a Day by Byrd Baylor (a Caldecott Honor winning book). Click here to go to my web page that contains ideas and teaching resources for this book: The Way to Start a Day lesson plans. Research UNICEF and write a summary describing the purpose of this organization. On my Peace Day web page you will many teaching resources that would be great to use for United Nations Day. Click here to go to Heidi's Peace Day Lesson Plans page. 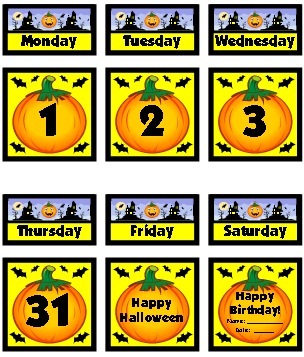 This printable calendar set for October includes smaller calendar pieces for the 7 days of the week that will fit inside your calendar pocket chart. 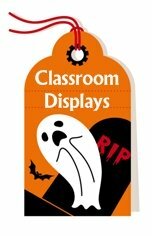 October teaching resources classroom display set. 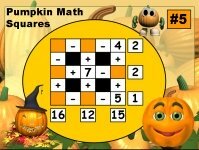 free download link for this October calendar set. Students write an acrostic poem with the letters that form the word P.U.M.P.K.I.N. 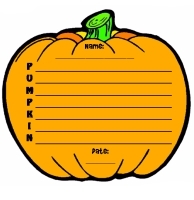 They cut the templates along the thick black border, and then they have unique pumpkin shaped poetry templates. 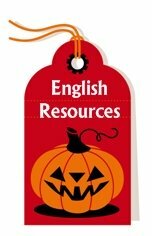 October is a fun time to include some poetry writing activities into your language arts lessons. For this activity, students write an acrostic poem with the letters that form the word G.H.O.S.T. 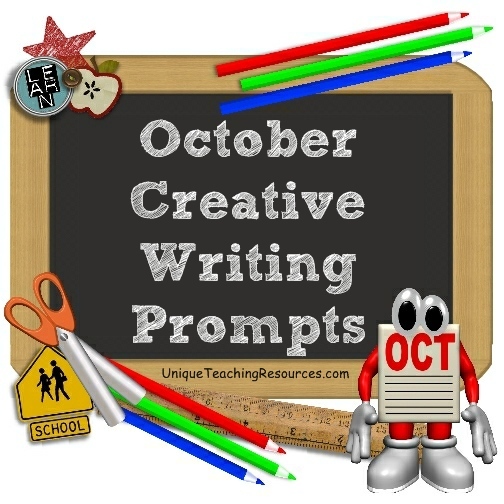 Thank you for visiting my October writing prompts page.